Study all the important Current Affairs from Current Affairs One-liners - 17th & 18th December 2017. 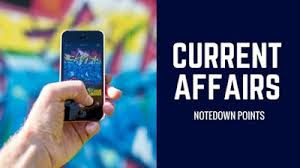 These Current Affairs One-Liners include all the important news updates related to Sports, Achievements, Recent Government Schemes which are very important for upcoming IBPS, SSC exams. India’s first Tesla X, a high-end electric car with self-driving capability, was registered at the Tardeo Regional Transport Office (RTO). R Hemalatha takes charge as Director of National Institute of Nutrition. Cabinet approves capital investment subsidy to industrial units located in North Eastern Region (including Sikkim). The National Green Tribunal (NGT) imposed a complete ban on plastic items like carry bags, plates and cutlery in towns located on the banks of the River Ganga like Haridwar and Rishikesh. Japan plans a record 46 billion dollar defense budget for the next fiscal year to strengthen its missile defense against the threat posed by North Korea. China plans to send up 10 more satellites from the southern island of Hainan over the next three years to monitor over the South China Sea. Jammu and Kashmir Bank launched a “J&K Sahafat Finance Scheme” for journalists, editors, employees of newspapers, and media houses. National Workshop on Role of Sakhi One Stop Centres (OSCs) in Strengthening Multi Sectoral Response to Violence was held in New Delhi by the Union Ministry of Women and Child Development (WCD). Vice-President Venkaiah Naidu will inaugurate a world conference on the Vedas at the Indira Gandhi National Centre for Arts (IGNCA). National Institute of Nutrition is situated in Hyderabad, Telengana. State Bank of India was established on 1st July, 1955. The head quarter of State Bank of India is situated in Mumbai. The CEO of State Bank of India is Rajnish Kumar. Yes Bank was established in 2004. FIFA stands for Fédération Internationale de Football Association. Gianni Infantino is the CEO of FIFA. The head quarter of FIFA is situated in Switzerland. UNESCO stands United Nations Educational, Scientific and Cultural Organization. The head quarter of Jammu and Kashmir Bank is situated in Srinagar. Mushtaq Ahmad is the CEO of Jammu and Kashmir Bank. The Jammu and Kashmir Bank was founded on 1 October 1938. Indira Gandhi National Center for Arts (IGNCA) is situated at New Delhi.